There are more than 40 different species of seahorses found in the world. 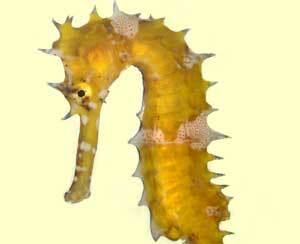 Habitat, anatomy, feeding, reproduction, predators and all the information about seahorses. There are more than 40 different species of seahorses found in the world. They are scattered with a wide diversification out there. Due to the unique appearance of the seahorse they are a very common pet. People do like to keep them at home in aquariums. Seahorse and Syngnathidae Family Information, Anatomy, Feeding, Communication, Reproduction, Predators. Facts about the Common Seahorse, the Pygmy Seahorse, the Leafy Sea Dragon, the Weedy Sea Dragon, the Pipefish and more. One of the most interesting living creatures in the bodies of water is the seahorse. They have a very unique look that people are quite interested in. With a face that looks like a horse that is where the name came from. The large snout on a seahorse is very prominent and that helps them to be easily identified. They don’t do well swimming in the water which is why they will often be seen in a stage of resting. They feed on a variety of different invertebrates and small fish. They are found in many bodies of water around the world. They prefer locations that are shallow, warm, and tropical in nature. They tend to blend in very wall to their surroundings so you may not see them at all unless they are pointed out to you. Some seahorses are very small too which makes them even harder to find. The smallest species are about ½ inch tall. The largest ones are around 8 inches tall. You will find plenty of species that are between these two spectrums. There are approximately 40 different spices that have been identified. While they all have some common features there are enough differences to put them into various categories. Some are able to change colors too so that they can consistently blend into their surroundings. Fossils of the seahorse are very few but there have been some significant findings. They are dated back to about 3 million years ago. It is believed that the seahorse evolved in order to do well in shallow areas of water. They were able to thrive on the sea grass habitats found there. They are also able to hide in those areas due to body blending in so well. The camouflage allows them to remain well protected against various types of predators. The males are the ones that will carry the eggs for the young. They are placed into his body by the female after some complex mating rituals have taken place. The seahorse doesn’t seem to do very well in captivity. Many people continue to keep them in an aquarium but they often die due to high levels of stress or disease. In many locations the number of them in the wild are being depleted. They are herbivores which means they only eat plant life. This has to do with their natural habitat being reduced in many locations. They are also heavily hunted in various places such as China to be used in herbal forms of medicine. Other locations such as Indonesia are also part of the trade for them to be heavily hunted and used. There are many natural predators of the seahorse but they vary depending on location. Some of them include the stingray, manta ray, penguins, and crabs. However, the weather is a huge problem for them and kills more adults than any other problem. They often die of exhaustion when they try to move for long periods of time in the fast moving waters. Usually they live in areas that are very mild in movement but the chances in weather can quickly alter that for them. In many locations huge nets are in place along the areas where the seahorse lives. This type of commercial fishing for them removes thousands of them from their natural environment every single year. There are many benefits that the seahorse offers to their natural environment. With so many of them being removed it has also upset some of that balance in many locations. This can have a rippling effect that creates overpopulation of many other living things in the various bodies of water out there around the world.